Today was day eight of Ramadan, and so far, my family has had typical iftari for the most part. Time for a change, for sure. Or at least something in addition to change it up. Things have been so busy lately, that I haven’t cooked much at all. 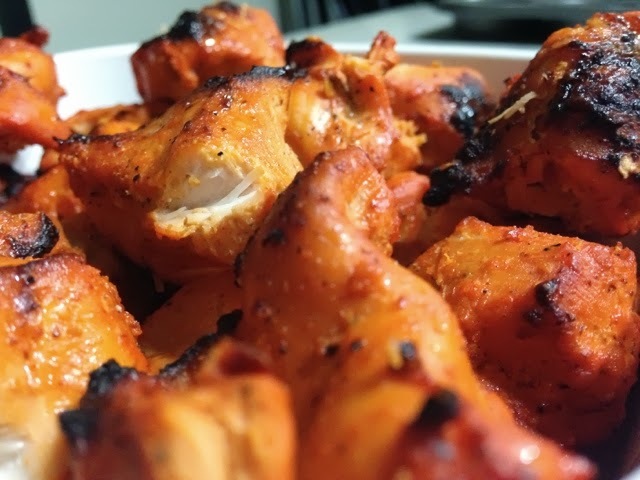 Today, I made boneless tandoori chicken from scratch, with no help with a tandoori mix like I normally do. I’m trying more and more to cook clean and know exactly what is in the meals we are consuming. While tandoori masala mixes are an easy go-to item in the pantry, my version is just as easy and delicious [and has no oil!]. 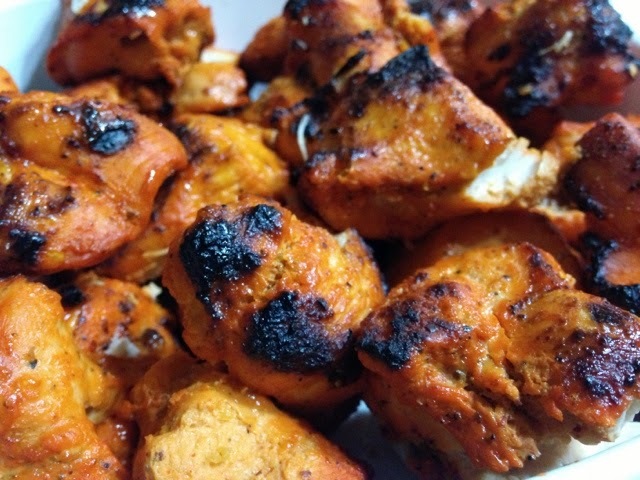 I used boneless chicken cubes and marinated it with: salt, pepper, paprika, chili powder, garlic powder, ginger powder, lemon juice, cumin powder, garam masala, yogurt, and grinded raw papaya [to tenderize]. Cumin and garam masala are things I don’t work with very often and was skeptical/unsure of how much to use so I kept it safe: a little goes a long way. Working with about 25-30 cubes, I’d say I used a little less than a teaspoon of garam masala and a little less than half a teaspoon of cumin powder. This part is optional, but you could also added a little food coloring to give it that tandoori color [again, a little bit goes a long way]. When I was ready to cook them, close to iftari time, I skewered them and put them under the broiler [on high]. Initially for 15 minutes, then take them out and flip all the skewers over, and then back under the broiler for another ten minutes. Just keep an eye on it… you want the charcoal color, but not for them to harden. This would, of course, work just as well with boned-in meat… I just prefer boneless white meat and tend to cook mostly with that [as is apparent I’m sure]. This chicken would work great in a wrap, alongside rice or other sides… or just with the raita I mentioned back in this post [my favorite! ]… whatever you prefer.